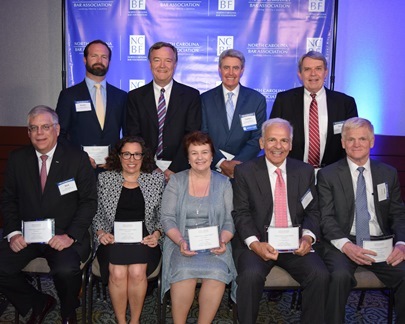 Four Wake Forest Law alumni are among the 11th class of Citizen Lawyer Award recipients who were recognized at the 2018 North Carolina Bar Association (NCBA) Annual Meeting held June 21-24 at the Wilmington Convention Center. Presentation of the awards took place on Thursday, June 21, at the new Annual Meeting Awards Dinner. The award recipients are Dustin T. Greene (JD ’08) of Kilpatrick Townsend & Stockton in Winston-Salem; Donald C. Prentiss (BA ’77, JD ’81)) of Hornthal Riley Ellis & Maland in Elizabeth City; Carlton F. Williamson of Williamson Walton & Scott in Whiteville; and Donald R. Vaughan (JD ’79) of Donald R. Vaughan & Associates in Greensboro. Vaughan is also an adjunct professor at the law school. The Citizen Lawyer Committee of the NCBA Young Lawyers Division, in conjunction with the NCBA Citizen Lawyer Committee, provided expanded coverage of the 2018 Citizen Lawyer Award recipients in recognition of their volunteer service and leadership in their communities and beyond. 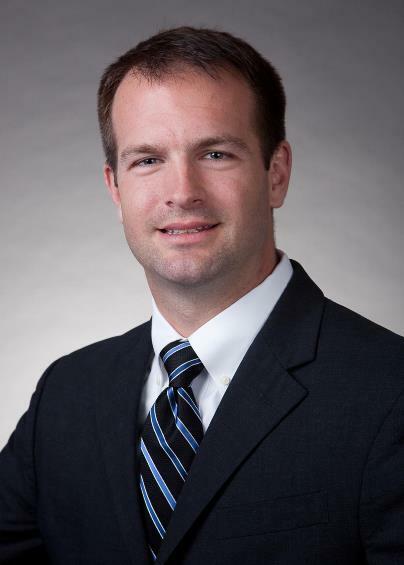 Dustin Greene is the recipient of the North Carolina Bar Association’s Citizen Lawyer Award. That Greene is the recipient of this award comes as no surprise to those who work with him in the office and in the community. Greene is a native North Carolinian who received his undergraduate degree from Appalachian State University, and his law degree from Wake Forest University. However, being an experienced and awarded litigator is Greene’s second career. Prior to becoming a partner at Kilpatrick Townsend & Stockton, Greene served in the United States Army where he was a member of the 75th Ranger Regiment. Greene’s time in the Army developed the service-oriented leadership which has driven his career and community involvement. Greene not only offers to assist in providing pro bono advice to organizations in the Triad, but also generously devotes his time. He personally invests in causes close to him. For example, given his background as an Eagle Scout, it is unsurprising that he would go on to be a member of the Boy Scouts Old Hickory Council Executive Board. Similarly, given the fact that he is an outstanding advocate, he also provides pro bono services to the Legal Aid of North Carolina and is a Barrister with the Chief Justice Joseph Branch Inn of Court. However, helping veterans is a cause that deeply moves Greene. Not only does he provide pro bono representation to veterans seeking service-connected disability, he also was a founding member of the Northwest Piedmont Purple Heart Foundation. This organization is devoted to recognizing and honoring the veterans who were wounded in battle. When the Northwest Piedmont Purple Heart Foundation requested information on forming a 501-C, they were lucky to have asked Greene. Instead of merely offering to provide pro bono advice, Greene took initiative, assisted in forming the organization, and went on to serve as its secretary for over three years. He continues to serve on its board. Greene’s interests are varied, and there are many organizations that need help growing and developing. Therefore, once the Northwest Piedmont Purple Heart Foundation grew, Greene found another organization in need of his assistance. Although the Winston-Salem Little Theater has provided quality performing arts to the Winston-Salem area since 1935, as a community-based organization, it requires dedicated volunteers to assist with its operations. Crediting his wife and daughter’s participation in the arts, Greene decided to contribute in his own way, and he currently serves as a board member of the Winston-Salem Little Theater. Moving forward, it is likely that Greene will continue assisting the community. Steve Berlin, also with Kilpatrick Townsend & Stockton offered kind words regarding Greene. Specifically, Berlin stated that Greene exemplifies true service and that Greene “zealously advocates for community causes.” He added that Greene “exemplifies what it means to be a citizen lawyer.” Given the depth and passion Greene exhibits for the community, he truly exhibits the spirit of the award. ELIZABETH CITY – For more than 35 years, Donald Prentiss has been an active citizen and leader in Elizabeth City. Although Prentiss has devoted many hours in the office and courtroom during his career as a civil litigator, his most noteworthy time has been spent within his community. Early in his legal career, Prentiss was inspired to get involved with the Food Bank of Albemarle. After seeing firsthand from some of his own clients that their next meal was not guaranteed, Prentiss wanted to do all he could to help feed those in need within his community. Prentiss has done just that for the last 30 years, which includes his role on the Food Bank of Albemarle’s Board of Directors from 1990 to 1999. Prentiss has been a true advocate for his clients and his community over the past 35 years and the North Carolina Bar Association is pleased to recognize Prentiss with the 2018 Citizen Lawyer Award. GREENSBORO – Don Vaughan has dedicated practically his entire legal career to exemplifying the characteristics of the Citizen Lawyer. Prior to receiving his law degree from Wake Forest in 1979, Vaughan began his career as the Legislative Clerk to esteemed United States Senator from North Carolina, Robert Morgan, in Washington. After getting a taste for political life, Vaughan was ready to serve his community. He was elected to seven terms as a member of the Greensboro City Council, two of those terms as Mayor Pro Tem. He was elected to two terms in the North Carolina Senate, one as Deputy Leader. He has also served on the Board of the North Carolina Chamber of Commerce, Greensboro Chamber of Commerce, Greensboro Merchants Association, and numerous other civic organizations. Vaughan served on the North Carolina Courts Commission and continues to serve as a member of the State Banking Commission. He received the Distinguished Award from the North Carolina Institute of Political Leadership and the Order of the Long Leaf Pine. Vaughan’s service to his community is not limited to just political office. He teaches State and Local Government as an Adjunct Professor at both Wake Forest Law School and Elon Law School. “I’m very pleased to be able to share my experience with law students,” Vaughan shared. Vaughan has previously been recognized for his service to the State of North Carolina as well. He is a two-time recipient of the “Leaders in the Law” Award from North Carolina Lawyers Weekly for his outstanding contributions as a member of the North Carolina General Assembly, in drafting and passing The Founding Principles Act and Susie’s Law. The Founding Principles Act requires that all students in North Carolina be taught the principles of the United States Constitution prior to graduation. The Founding Principles Act recently served as a model for several laws passed in South Carolina and Georgia, and is currently pending in several states. Vaughan’s lifetime commitment to serving his community has made him an ideal candidate for the Citizen Lawyer Award and a model of civic engagement for current and future generations of lawyers. WHITEVILLE – The North Carolina Bar Association has recognized Carlton F. Williamson with its Citizen Lawyer Award. This award honors attorneys who dedicate their time and talents to serving their communities and inspire others to do the same. Williamson’s past and present extensive community involvement includes serving as a Director of the Friends of the North Carolina Museum of Natural Sciences at Whiteville, pro bono counsel to the restoration of Vineland Station (the historic railroad depot in downtown Whiteville), longtime Executive Board member and Past President of the Cape Fear Council of Boy Scouts of America, Chairman of the Church Council of the Whiteville United Methodist Church, Past President of the Whiteville Country Club, among other community appointments and involvement. Notably, Williamson is a founding and current member of the Board of Directors of the Columbus Regional Healthcare System Foundation, Incorporated (formerly the Columbus County Hospital Foundation) formed in 2002 to support the Columbus Regional Healthcare System in its mission to provide healthcare to the people of Columbus County and surrounding communities. Says Terrie H. Priest, Vice-President of Business Development & Community Relations for Columbus Regional Healthcare System, “Everyone needs a Carlton Williamson on their board. Since the beginning of the Columbus Regional Healthcare System Foundation in 2002, Carlton has been a board member. He has always been dedicated to the Foundation in its mission of supporting the healthcare needs of our community and in true volunteer spirit Carlton contributes his time, talent and resources to ensure the mission of CRHSF is met. For more than 30 years, Williamson has been an active citizen and leader in the Whiteville and Columbus County community. Williamson’s longest involvement has been with the City of Whiteville as City Attorney and as General Counsel to Southeastern Community College in Whiteville. In those positions he has worked closely with and actively supports the Southeastern Community College Foundation, Incorporated and the Columbus Jobs Foundation, Incorporated (formerly the Columbus County Committee of 100). Williamson’s longstanding commitment to these and other similar organizations to advise and promote economic development in Columbus County is evidence of his commitment to the area’s longevity and growth. Over his nearly 38 year legal career, while Williamson could have curbed his civic and volunteer commitments at any time, he chose to continue to be immersed in this life of service. He continues to serve in his local community remaining active in the Whiteville Rotary Club and his church, the Whiteville United Methodist Church. Williamson has set a fine example of balancing his legal career with being an active and generous community servant over the past 38 years and the North Carolina Bar Association is pleased to recognize Williamson with the 2018 Citizen Lawyer Award.